Most institutions place grand public facades over less impressive interiors where work actually gets done. For instance, Capitol Hill looks picture postcard perfect from the Mall, and once inside everything is grand views and stern paintings of founding fathers. Few visitors ever guess that underneath squirms a maze of twisty concrete passageways, painted in dull institutional colors, that snake their way to various congressional office buildings. 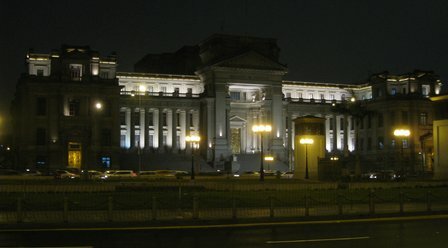 So it is with the Palacio de Justicia: as imposing as the facade looks from out front, the public entrance leads into a near-windowless basement, the entrance hall lined by clerks windows and what appeared to be shops, a bank, and several enterprising stalls selling instructional videos. I think these last were either BarBri-style examination study guides or CLE videos. No one stopped us from heading further into the warren of offices, where every hallway held a new collections of Secretariats, Clerk's Offices and other administrative necessities. The rooms with glass windows usually revealed some small desk, perhaps with a computer but often with a typewriter, surrounded by enormous jenga-balanced stacks of paper. While U.S. courts and law offices are far from paperless, the sheer volume of paper, often taking up most of the interior space of a room, brought home just how much has changed in my lifetime with the near-ubiquity of online documents. Another unexpected feature sits in the basement of the Palacio: a small chapel where those coming before the courts can pray. An older woman was, I think, making her way through a rosary, but otherwise it appeared empty. The upstairs/downstairs nature of the Palacio becomes immediately apparent when you happen across any of the marble staircases leading upwards from the bottom level. Most of the basement is flourescent, contrasting sharply with the natural light that filters its way down the stairwell by reflecting off the white stone. Once up the stairs, ceilings are much higher, hallways form around broad courtyards, and institutional paint on concrete is replaced with marble, brass and stained wood doors. Towards the front of the building lie the courtrooms of the Supreme Court. Divided into three sectors--Constitutional and Social, Civil, and Criminal--each sector has its own set of rooms. The Constitutional sector did not seem to be in session on the day that we visited, but several of the Civil sector courtrooms were hosting hearings. I listened in on one from the doorway, and it seemed a relatively sedate affair. The courtroom held few visitors, although one side of the courtroom was occupied with a series of desks, each containing a black-suited young man, presumably a clerk for the court. An elderly lawyer, grey hair fading to bald, read his presentation from a document that he held in front of him. The justices let the attorney speak for about two minutes, while one member of the panel stared fixedly at the computer screen on his bench. Finally, one of the judges asked a question, politely and in a low voice, whereupon the attorney answered and continued his speech. Unclear on whether non-litigants were allowed, we didn't go into a hearing itself, but instead made our way in a circuit around the various courtrooms, trying to make sense of the dockets posted on the walls. I admired the decorations: wall clocks set into the marble, and heavily-ornamented brass lamps rising from the railings on the second floor. We passed very few people, especially in comparison to the busy basement, and if anyone wondered what we were doing there, he didn't ask. A few minutes later, we walked out the doors we'd come in, crossed the park, and had a look in the Sheraton Lima. At least viewed from the lobby, it's a fine hotel, and certainly convenient if you ever have business before the courthouse. Walk one hundred feet north of the Sheraton and you can buy a variety blended of pisco sours in the middle of an upscale shopping mall, assuming that all of the legal tourism has left you with the need for a drink. 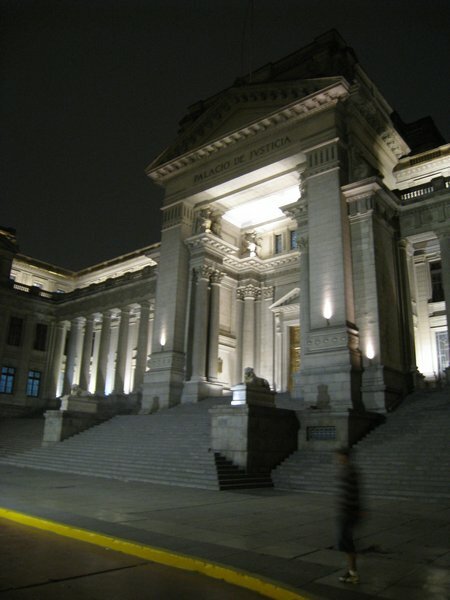 We did manage to get some exterior pictures of the Palacio on our way to the airport as we left for Argentina. The building looks incredible at night.